A married Indian woman in a tribal-dominated village in Madhya Pradesh's Jhabhua district was beaten up and shamed because she ran away from her home, with a man she loved, the police said. The 27-year-old woman was also forced to carry her husband on shoulders as a punishment. Two people have been arrested. In a video that was widely shared on Saturday, the woman, carrying her husband on shoulders, struggles to walk as a group of men around her hoot and try to shame her, according to NDTV report. An old man laughs and dances in front of her and another man hits her with a stick. She can barely carry her husband's weight but she is forced to continue to walk. The woman ran away from her husband's home in Devigarh with the man she loved to Gujarat a few days ago, said police. Her husband and in-laws traced her two days back and she was brought to Devigarh Saturday. 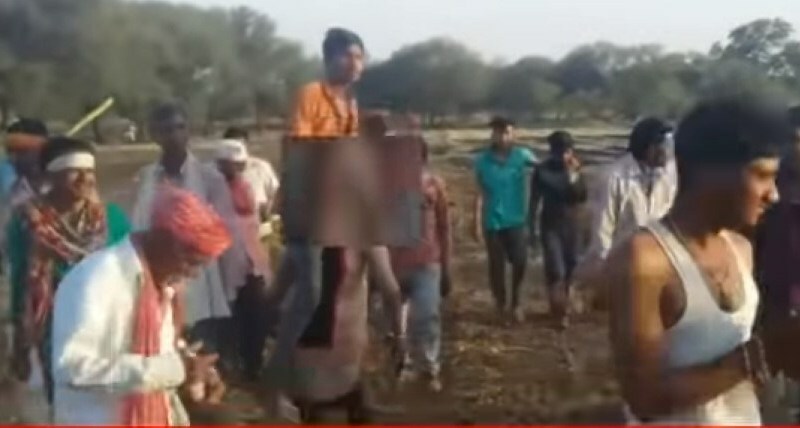 The villagers, in order to punish her, told her to walk carrying her husband on shoulders; people around filmed her and circulated the video on WhatsApp. < >Vijay Dawar, Additional Superintendent Of Police, Devigarh, giving more details, said, "The woman left her home about ten days back. About 10-12 men misbehaved with the woman after she was back in the village and publicly shamed; they snatched her dupatta. We are trying to ensure there isn't a repeat of such incidents." A case was registered against nearly a dozen people. Reacting to the incident in the village, about 340 km from Bhopal, Superintendent of Police, Jhabhua district, Vineet Jain said: "A woman was tortured and humiliated in public. This is really inhuman. I have told the police station in-charge to go there with additional force and have told them that whoever was present there at the time of the incident should be called to the police station."